Is it a bird? It's certainly not plain! 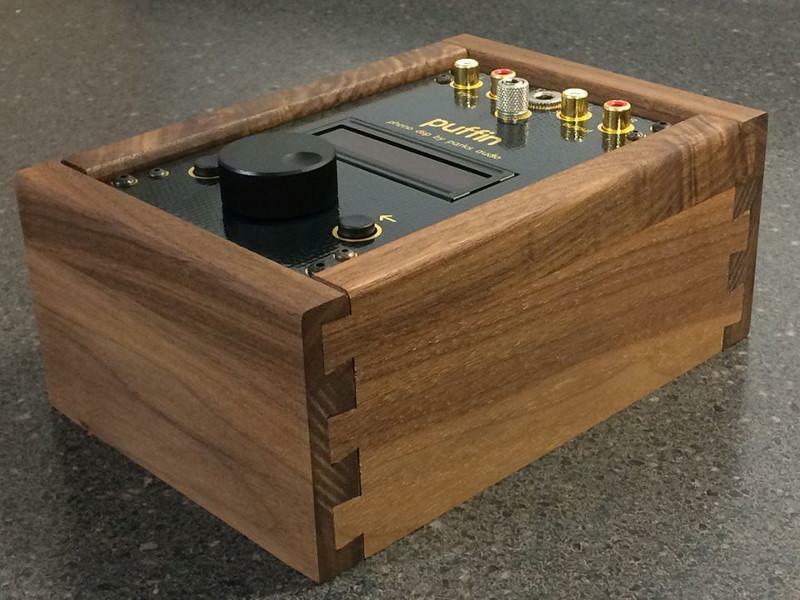 “The Puffin represents a radical departure from other phono preamps as it is a DSP-based phono preamp, but it still hooks up like a normal phono preamp with analog inputs and outputs. No computer or internet is necessary, and it does everything real-time. For a phono preamp gain is everything, and with the variety of cartridges on the market and many kinds of sound systems with different specs, traditional phono preamps don't provide enough flexibility in gain settings. 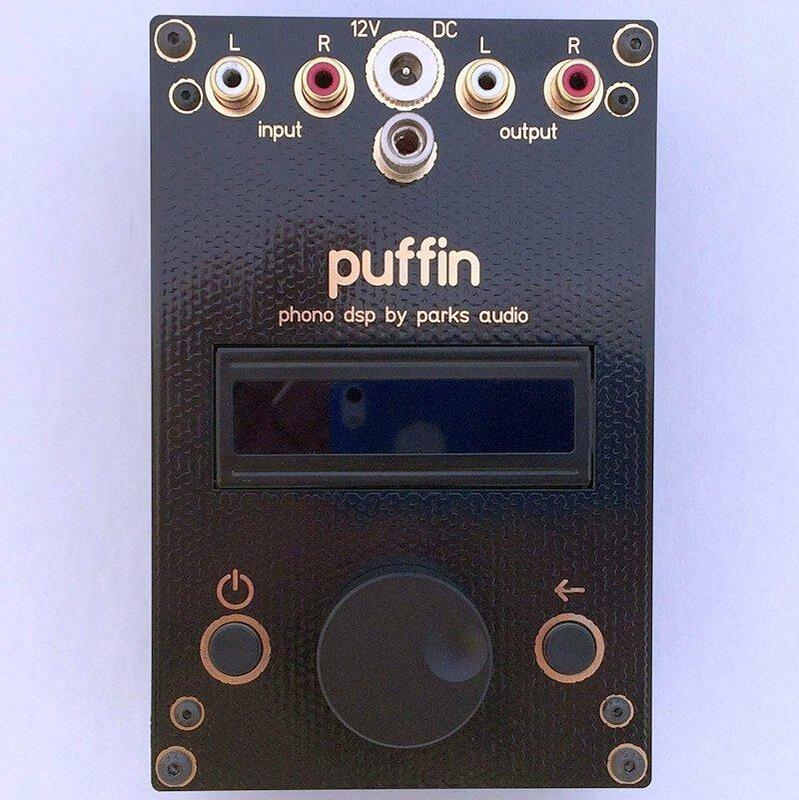 With the Puffin, you have twenty gain settings: from -4 dB (CDs) to 72 dB (MCs). This is a real game changer. For best noise performance, I'd recommend 0.25 mV to be the bottom limit for moving coils. The Puffin also gives you full control of the sound character, not just a matter of luck with cartridge loading. I think the Tilt functionality will be the most used feature and it works great with moving coils and CDs, too! It quickly gets the warmth/detail perfect, and you may even tweak the settings from LP to LP depending on the recording. So, it's a MM and MC phono preamp, it's an audio sound processor as well, and it can be used as an easy system analyser, with any analogue source. There are no gimmicky effects, though. It reveals shortcomings, however minor or major, in your audio system and audibly and instantly corrects them to what you enjoy. It improves the sonic character without adding annoying artifacts. Through experimenting with the parameter changes, you can pinpoint flaws you may not have previously noticed. Fix bass, soundstage, timbral character, phase, balance, and more. As merely a phono preamp, with all parameters set to 'normal', it makes my records sound superb. Then in addition it handles a wide range of sources from low output moving coil pickup to high output digital player, and from 78 rpm records to SACDs. And then it tailors the sound from your system to your personal tastes. What's not to like? I asked Shannon Parks to tell the story of the Puffin. “The name Puffin came to us after a day on the ocean while whale watching, and seeing lots of puffins. Since the early 2000's, I had been designing and selling tube circuit boards as a hobbyist under the DIYtube brand. One of the final projects developed into a 6DJ8-based tube phono preamp that I called the Budgie. It struck me as my first design which I could fully build and sell as a consumer audio product, so in 2013 I quit my job and took the leap from a hobbyist into a full-time audio company. The product line consisted of the Budgie phono preamp along with several different step up transformers for moving coil support. Folks loved the Budgie, but it was a single gain design for moving magnet cartridges only (38 dB). As time passed, it became clear to me that I needed to sell a phono preamp that supported all the cartridges being manufactured, and that would require a huge range of gain settings. Also, the Budgie made use of adjustable loading for moving magnets, so it could adjust the warmth or detail of these high inductance carts, and the customers really loved it. Unfortunately, this loading trick only works with moving magnet carts, and I really wanted that flexibility with low inductance moving coils and moving irons, too. I was always getting emails from customers that wanted their expensive moving coils to sound warmer. So I knew I wanted to lots of gain and tone control, but I wasn't sure how to accomplish these features without a large and complicated design. I wanted something small and affordable that could appeal to both traditional audiophiles as well as newer vinyl listeners. In early 2017, I received a newsletter with an announcement for license free DSP software to be used with low-cost ARM microcontrollers. I was intrigued by the possibilities, and after research determined I could write my own code in C using the DSP libraries provided by ARM for the Cortex-M processors. Some DSP concepts are pretty easy to understand. For example, you can easily scale a stream of audio samples by a single number in floating point. Multiply it by 0.5, and the signal drops by 50% or -6 dB. Multiply the samples by -1 and you invert the signal. The possibilities almost made me shake with excitement. I could couple my low noise analog gain techniques - learned with the Budgie design - with a DSP “brain” that would do all the RIAA equalization, so that I wasn't stuck with a single feedback network that required high tolerance parts. It could also widely adjust the gain range without feedback network error. It could even support all the alternate equalization methods used in the 20th century - not just for LPs but also 78s. I had a very early DSP prototype working about a month later using some evaluation boards from eBay. With this proof of concept I was convinced it would be a huge step forward and a ground-breaking device. I then continued Puffin R&D for a year, launching it May 2018. 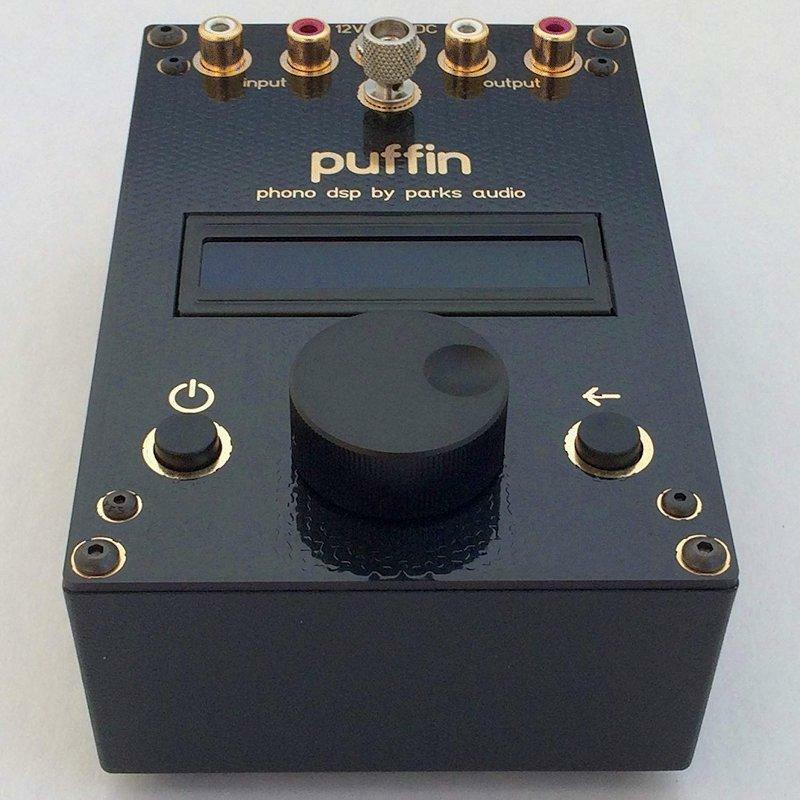 At the same time, I discontinued my Budgie phono preamp and completely changed over - and bet everything - on the Puffin. Out of the box, I plugged to the mains supply, connected my turntable (Hana ML mc, then Hana EL mc, followed by a Gold Note Vasari Red mm, mounted on The Wand 14-4 Turntable and The Wand Plus tonearm), then connected the Puffin to my Black Ice Audio F360 preamplifier. After switch on and only a few minutes use to acclimatise, navigation through the parameter settings menu was easy. Just three controls are used: on/off switch, navigation knob, and set/select button. The footprint is just 140 x 90 mm. In extended listening, I especially like the Air, Mode, and Mixed Phase effects, and that I can 'set the tone' of any one of several cartridges with ease. What I really like is that the unit does not introduce audible circuit noise and the sound is not altered except by the chosen effects settings. The software can be updated fairly easily by taking the cover off and connecting to the Internet via the supplied USB cable through a PC. I'm not so keen on the top-mounted input and output sockets, as heavy interconnects (such as my Supra Swords) move and tip the Puffin as it is relatively lightweight. I would prefer that the sockets be mounted on the rear side of the case. The Puffin concept caught my attention as a long-time record player, and I wanted to find out if my listening pleasure would be enhanced. I have to say the sound quality is not compromised by swapping this unit for my usual phono stage (Black Ice Audio F159 tube, or M2Tech Nash). The bonus is that it introduces 16 effects allowing me to cater for any cartridge, old records, reducing surface noise, and adding 'tube' harmonics warmth. Add to that the option of applying the effects to the output from my CD player, network player/streamer, or radio tuner, with the prospect of future upgrades, and this is a very versatile machine, at a very affordable and good value price. Hats off to Shannon Parks for his ingenuity and expert execution. Recommended for anyone who is a vinyl junkie, or indeed any tweaker trying to get the best from their system.